Examples of asymmetric Mathieu-Gauss beams. Different rows correspond to different degrees of asymmetry (low asymmetry to high asymmetry, from up to down, respectively). Different columns correspond to different ellipticities (low ellipticity to high ellipticity, from left to right, respectively). Optical lattices are structures of light generated by interfering optical laser beams, that resemble a crystal lattice. 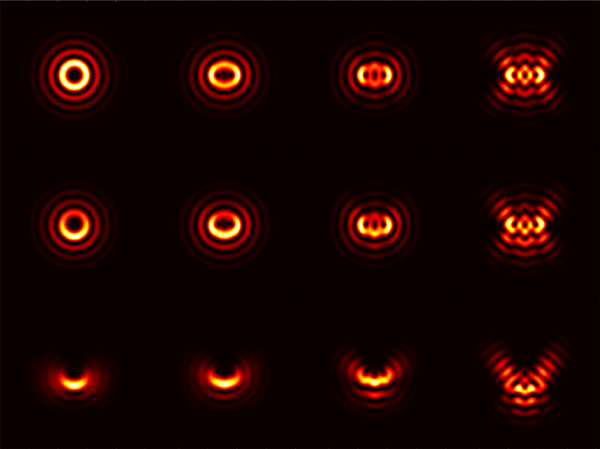 This interference creates a standing wave pattern that can be useful for the study and applications of light-matter interactions. A technique to generate such structures is using nondiffracting beams, i.e. beams whose intensity shape remains invariant under propagation, allowing a key feature in controlling light and optical manipulation of matter. However, obtaining nondiffracting beams can constitute a challenging problem because these beams must satisfy several restrictive mathematical conditions. In fact, an important and still open question is to determine what kind of transverse shapes imposed on a laser beam can be invariant propagated. To date, there are several techniques focused on symmetry relations, numerical relaxation procedures or even in genetic algorithms to obtain novel and complex quasi-nondiffracting patterns. However, truly invariant and useful patterns are even by far more difficult to obtain, being the mathematical efforts to generate these nondiffracting beams formidable. Researchers from Tecnologico de Monterrey at Mexico have been able to generate a novel kind of nondiffracting structure, the asymmetric Mathieu beam and they have corroborated experimentally their theoretical prediction by generating and propagating these beams, demonstrating their invariant behavior. These novel nondiffracting beams have three control parameters: the degree of ellipticity, the degree of asymmetry and the location of the respective symmetry breaking. Moreover, these beams can be implemented in an experimental setup by an easy modification to the standard and more well-known nondiffracting Mathieu beams. The generation of asymmetric Mathieu beams can be interesting for studying and developing new technologies in manipulation of Bose-Einstein condensates , applications of optical lattices for quantum computing, trapping of in-vivo and colloidal particles, and for soliton routing, just to name a few. This work has been published in Chinese Optics Letters, Vol. 16, Issue 12, 2018 (Arturo Barcelo-Chong et al., Asymmetric Mathieu beams). Associate professor Servando Lopez-Aguayo, leader of the research project, believes that these results could shed light on novel techniques to generate even more complex invariant structures. As a holy grail, the Mexican researchers are looking to create truly and useful nondiffracting beams on demand, being also interested in diffraction management to achieve different kind of propagation dynamics. Further work will be focused on applications of these nondiffracting modes, for example, in nonlinear optics for self-trapped beams in routing and steering and in the generation of dynamic optical asymmetric lattices.